Hardcover, 368 pages, 13.5 x 21.0 cm, 5.3 x 8.3 in. 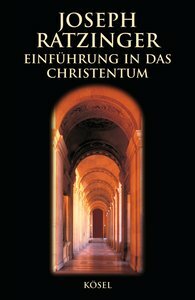 "Introduction to Christianity" is one of Cardinal Ratzinger's most important and widely read books. It was first published over 30 years ago, many changes and significant events have occurred in the world, and in the Church. But even so, Ratzinger's fundamental approach in this book is still very timely and crucial for the spiritual needs of modern man. That approach puts the question of God and the question about Christ in the very center, which leads to a "narrative Christology" and demonstrates that the place for faith is in the Church. Thus, this remarkable elucidation of the Apostle's Creed gives an excellent, modern interpretation of the foundations of Christianity. Ratzinger's profound treatment of Christianity's basic truths combines a spiritual outlook with a deep knowledge of Scripture and the history of theology.